Effective medical management of atrial fibrillation shows promise for improvement of cognitive and communication symptoms. When presented with patients with dementia symptoms, physicians should consider ruling out atrial fibrillation as a contributing factor to cognitive decline. There are many subtypes of dementia. These subtypes differ in the communication and cognitive deficits that arise; however, the general communication deficits associated with dementia include trouble with understanding (eg, difficulty understanding what is spoken in a conversation or written in a letter) or using verbal or written language (eg, difficulty speaking in a conversation or writing a letter). Although the early deficits of dementia are dependent on the suspected cause, one of the earliest symptoms of dementia in spoken language is having difficulty finding words, which may be noted in the person's increased use of "empty" or nonspecific vocabulary (eg, "stuff" or "thing").2 Due to memory loss and other cognitive deficits, individuals with dementia experience difficulty with conversations, and the topics of their conversations become repetitive and less organized. An individual with dementia also tends to have difficulty interpreting jokes and sarcasm. These communication deficits are typically treated by a speech language pathologist. The speech-language pathologist trains the individual with dementia and the conversation partners to use communication strategies to compensate for weaknesses and ensure the most effective communication interactions for as long as possible. 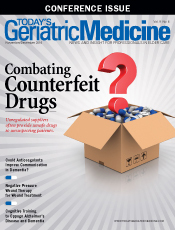 Physicians may also prescribe medications to help maintain cognitive functioning and slow further cognitive decline. Because dementia is common in the geriatric population, many have accompanying medical conditions for which medications are prescribed. Such conditions may include hypertension, high cholesterol, diabetes, and/or atrial fibrillation (A Fib). In addition to prescriptions for blood thinners for A Fib, increased surgical procedures within the dementia population due to falls may result in the prescription of anticoagulants, or blood thinners, to prevent blood clots and strokes after surgery. There is an interesting relationship among A Fib, dementia symptoms, and medication. Results of the Rotterdam Study,5 which examined the occurrence of several diseases in the geriatric population in the Netherlands, found A Fib to be strongly associated with dementia and impaired cognitive function. Increased association was noted in women and in younger participants. One year later, a similar association between A Fib and impaired cognition was noted in a group of men in Sweden. Improvements in cognitive performance were noted in men treated with digoxin.6 A Fib was further established as a risk factor for dementia in studies in 20077 and 2008.8 In 2010, Bunch et al9 established the link between A Fib and dementia in the United States. As with the previous studies, confounding factors of other disease processes were controlled for; therefore, it was determined that there was an "independent" link between A Fib and dementia. Jacobs et al10 found that persons with A Fib who are outside of the international ratio, or therapeutic range of warfarin (2 to 3), are at higher risk of developing dementia symptoms due to under- or overanticoagulation. Bunch and colleagues (2016) most recently found that those treated with wafarin for A Fib were more at risk for dementia than those treated with this medication for other conditions, increasing the strength of the link between A Fib and dementia. The investigators also noted increased dementia risk for participants both with and without A Fib when anticoagulation was not within therapeutic range. To date, no studies have examined specific communication improvements related to anticoagulation in patients with A Fib and dementia. Several months after her fall, Momma was unable to stand and was taken to the hospital, where she was diagnosed with a herniated disc. She was transferred to a skilled nursing facility for rehabilitation and remains at that facility for long term care due to her progressing dementia symptoms. Upon admission to the skilled nursing facility, she was diagnosed with a benign irregular heartbeat. Seven months after her admission, a blood clot was discovered in her leg. Momma was diagnosed with A Fib. The blood clot was initially treated with Lovenox, and Momma was then transitioned to warfarin. She remained on warfarin and her previous blood pressure medications for five months, at which time she suffered a transient ischemic attack. At the onset of this attack, Momma became unresponsive and lost control of bowel and bladder function. She was unable to speak. After about two hours, she began to regain the ability to speak, and within several hours returned to premorbid status. In addition to medications for hypertension and warfarin, Momma began to take clopidogrel (brand name Plavix), an additional medication used to control blood clots. She remained on the blood pressure medications lisinopril and hydrochlorothiazide throughout all events. Approximately one week following administration of warfarin, Momma's family noted significant improvements in communication. These improvements were brought to the attention of the investigators one year following the start of blood thinners. The family reported that prior to the administration of blood thinners, Momma engaged in conversation that was repetitive and limited in the range of topics. They also reported that she was exhibiting a gradual decline in initiation of conversation as well as in response time in conversation. The family had several video clips of Momma that were collected for nostalgic reasons. Permission was obtained to analyze the video clips and determine the extent of improvements, if any, following the administration of blood thinners. • maintenance (six months after the start of warfarin). In order to further assess and track possible improvements, video content was analyzed at each stage. Qualitative and quantitative improvements were measured at each stage and compared. The 14 videos were transcribed word for word and systematically analyzed following the conversation analysis (CA) approach of Sacks, Schegloff, and Jefferson (1974). CA is a qualitative research method that allows the analysis of patterns of verbal and nonverbal behaviors in a systematic way. In addition to qualitative changes identified by CA, relevant quantitative changes were also identified following the regular use of blood thinners. Quantitatively, improvements were noted in Momma's communication. By the maintenance phase, Momma's rate of speech increased from below average rate of speech to within normal limits. The percentage of her utterances that expanded on the conversational topic increased by 38% from the start of blood thinners to when the blood thinners stabilized. Momma's nonverbal communication, or gestures, increased and were utilized for a wider range of communicative functions. All types of topic initiations became more diverse and less repetitive. These results revealed that overall Momma began actively participating in conversations following the start of the blood thinners. Although improvements were first seen following the start of warfarin, the role of the added Plavix five months later presents a confounding variable. Gains were maintained beyond these five months, and no other medication changes were made. Whether the maintained gains resulted from warfarin alone, Plavix alone, or an interaction between the two anticoagulants cannot be determined from this study. Regardless of whether improvements were the result of one or a combination of anticoagulants, the changes observed suggest important clinical implications for caregivers, speech-language pathologists, and other medical professionals when considering the symptoms of an individual with vascular dementia. From a medical standpoint, patients presenting with dementia symptoms and/or their loved ones may wish to speak with their physicians to determine whether ruling out A Fib as a potential contributing factor to cognitive difficulties is appropriate. By considering all possible contributing factors to dementia symptoms, an individual with dementia will have the best environment in which to effectively communicate wants, needs, and ideas. — Sarah E. Tokach, MS, CF-SLP, is a recent graduate from the department of speech-language pathology at Misericordia University in Dallas, Pennsylvania. She has published and presented nationally and internationally on the topic of stuttering. Her recent focus is on the care of patients with neurocognitive, speech, language, and swallowing disorders. This research project is her master's thesis topic. — Kathleen Scaler Scott, PhD, CCC-SLP, is an associate professor in the department of speech-language pathology at Misericordia University and a board-certified specialist in fluency disorders. She has published and presented nationally and internationally on the topic of cluttering, disfluency in autism spectrum disorders, and clinical treatment outcomes. — James Siberski, MS, CMC, is an assistant professor of gerontology and the director of the geriatric care management graduate certificate program at Misericordia University. He is also an adjunct faculty member at the University of Scranton in Pennsylvania. — Ruixia Yan, PhD, CCC-SLP, is an associate professor in the department of speech-language pathology at Misericordia University. Her research interests are on child language development and disorders, narratives in autism spectrum disorders, and multilingualism in speech-language pathology. 1. Manasco MH. Introduction to Neurogenic Communication Disorders. 1st ed. Burlington, MA: Jones and Bartlett Learning; 2014. 2. Müller N, Guendouzi JA. Discourses of dementia: a call for an ethnographic, action research approach care in linguistically and culturally diverse environments. Semin Speech Lang. 2009;30(3):198-206. 3. Fong LN. Balancing anticoagulant therapy. Geriatr Nurs. 1991;12(1):15-17. 4. Brace LD. Current status of the international normalized ratio. Lab Med. 2001;7(32):390-392. 5. Ott A, Breteler MM, de Bruyne MC, van Harskamp F, Grobbee DE, Hofman A. Atrial fibrillation and dementia in a popular-based study: the Rotterdam Study. Stroke. 1997;28(2):316-321. 6. Kilander L, Andrén B, Nyman H, Lind L, Boberg M, Lithell H. Atrial fibrillation is an independent determinant of low cognitive function: a cross-sectional study in elderly men. Stroke. 1998;29(2):1816-1820. 7. Miyasaka Y, Barnes ME, Petersen RC, et al. Risk of dementia in stroke-free patients diagnosed with atrial fibrillation: data from a community-based cohort. Eur Heart J. 2007;28(16):1962-1967. 8. Knecht S, Oelschlager C, Duning T, et al. Atrial fibrillation in stroke-free patients is associated with memory impairment and hippocampal atrophy. Eur Heart J. 2008;29(17):2125-2132. 9. Bunch TJ, Weiss JP, Crandall B, et al. Atrial fibrillation is independently associated with senile, vascular, and Alzheimer's dementia. Heart Rhythm. 2010;7(4):433-437. 10. Jacobs V, Woller S, Stevens S, et al. Time outside of therapeutic range in atrial fibrillation patients is associated with long-term risk of dementia. Heart Rhythm. 2014;11(12):2206-2213. 11. American Psychiatric Association, ed. Diagnostic and Statistical Manual of Mental Disorders. 5th ed. Washington, D.C.: American Psychiatric Association; 2013. 12. Planning for care costs. Alzheimer's Association website. https://www.alz.org/care/alzheimers-dementia-common-costs.asp. Accessed May 9, 2016.